Computed tomography of the abdomen with contrast shows remarkable parietal peritoneal thickness (red arrow). Also noted is bilateral renal enlargement with innumerable renal cysts (yellow arrow), confirming diagnosis of Autosomal Dominant Polycystic Kidney Disease. There is a small amount of ascites and organization of loculated fluid collection (orange arrow) in the right upper quadrant. Small bowel dilatation (blue arrow) represents ileus. Peritoneal dialysis is a home-based dialysis modality. In the US, 7.5% of the total dialysis population uses peritoneal dialysis.1 Peritoneal dialysis catheter-related peritonitis is a well-recognized complication, with an annual mortality rate as high as 16%.2 Although peritoneal dialysis-associated peritonitis treatment has been standardized, peritoneal dialysis catheter may require removal in cases of relapsing or refractory peritonitis and mycobacterial or fungal peritonitis.3 In such instances, intravenous antibiotics remain the mainstay of the treatment. We hereby present the case of a patient with end-stage renal disease on long-term peritoneal dialysis, who presented with peritonitis, without clinical improvement after prolonged treatment with intravenous antibiotics and removal of the peritoneal dialysis catheter. A 49-year-old man with end-stage renal disease was on peritoneal dialysis for nearly a decade. He presented to the Emergency Department with cloudy effluent, abdominal pain, and fever. The patient also reported chills, nausea, and nonbloody emesis with diarrhea. Peritoneal dialysis fluid analysis revealed a white blood cell count of 3800 cells/mm3 and peritoneal fluid culture suggested Klebsiella pneumoniae. Frank tunnel infection led to removal of the peritoneal dialysis catheter and the patient was transitioned to hemodialysis. He was initially started on intravenous ceftazidime and vancomycin for treatment of suspected peritonitis and then later switched to meropenem per sensitivity. 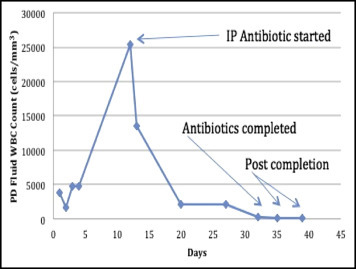 Despite ongoing intravenous antibiotics therapy directed by culture sensitivities and removal of the peritoneal catheter, he continued to have fevers, significant abdominal pain, and persistent peritoneal fluid leukocytosis. He underwent follow-up imaging and was noted to have an ileus and enteritis, which was ultimately felt to be related to worsening of bacterial peritonitis and associated adhesions and inflammation (Figure 1). 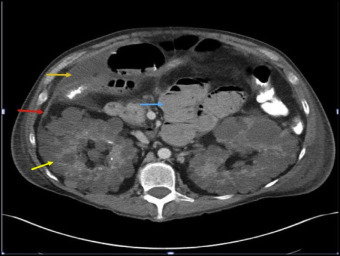 Persistent peritoneal fluid collections, worsening abdominal pain, and leukocytosis raised the possibility of nonresponse to peritonitis or worsening of peritonitis. We considered that appropriate and sensitive antibiotics might not be achieving adequate peritoneal concentration. Abdominal drain placement was done on the right lumbar region, and subsequently, intraperitoneal antibiotics were initiated. He began to show clinical improvement in 2 weeks (Figure 2).